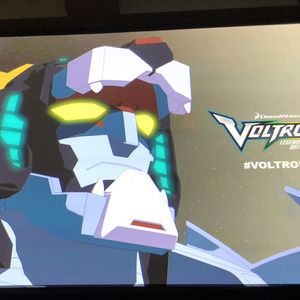 This podcast is our COMPLETE coverage of Voltron at San Diego Comic-Con (SDCC) 2018. Marc shares everything that happened at SDCC with Greg, who is hearing it for the first time, including interviews with Bex Taylor-Klaus, Jeremy Shada, Rhys Darby, Josh Hamilton, Lauren Montgomery, Joaquim Dos Santos, and Kyle Anderson. Also, we cover the Voltron panel, signings, SDCC exclusives, and we are excited to announce the winner of the Voltron Season 6 Prize Pack, and introduce a new SDCC Voltron Prize Pack and how to enter to win it! One of the first things we talk about is an announcement made for a Voltron book coming in 2019 by Andrew Farago, who had Original Voltron Director Franklin Cofod on a panel called Totally Awesome: The Greatest Cartoons of the 80's. His Voltron book will be called Voltron: The Ultimate Visual History, published by Insight Editions in 2019. Of course, we will have Andrew on the podcast when that book is released! Of course, we know you all want to hear about the interviews we had with the Cast and Crew of Voltron Legendary Defender! So, in addition to hearing them on the podcast, you can also WATCH them on our YouTube Channel! We also wanted to mention that Voltron Legendary Defender's Legendary Voice Director Andrea Romano was brought out of retirement to do an episode commentary for Form Podcast, but Marc was also able to interview Andrea, because she was also brought back for the Batman: The Animated Series Panel at SDCC. We were so happy to talk to Andrea Romano again!! Also, we covered the Voltron Legendary Defender Panel at SDCC and the signings of both the cast and crew at the autograph area AND Tim Hedrick and Mitch Iverson at the Lion Forge Booth for the Voltron Legendary Defender Comics, Vol 3, Issue 1 SDCC Exclusive Variant Cover! LEGO Ideas Voltron, which we covered in our last podcast, but can't help talking about AGAIN, because it's so awesome!!!! Don't forget, EVERYONE can get their own LEGO Ideas Voltron on August 1, 2018 at Shop.LEGO.com or at ANY LEGO Store in the world! Playmates Toys Hyperphase Voltron, which is a beautiful set I picked up at the Entertainment Earth booth! Bandai Super MiniPla Voltron Model Set with the exclusive Blazing Sword! Han Cholo Classic Voltron Membership Kit and VLD Enamel Pins, Blue Lion Ring and Bayard Pendants! We were so excited about the announcements for Season 7 being 13 episodes, coming to Netflix on August 10, and that the remaining 13-episode drop will occur before the end of this year, so we are thinking December, but don't quote us! And it is certainly cool that we will have a complete 78-episode Voltron story on Netflix , we will be sad when it is all over, because it is such an amazing series. We want to thank the whole cast and crew of Voltron Legendary Defender at DreamWorks Animation, all the animators at Studio Mir, and all the people at Universal, DreamWorks, Team Click and Netflix who have allowed us to cover everything for Voltron. Thank you! On our next podcast, we'll be reviewing episodes 2, 3 and 4 of Season 6 of Voltron Legendary Defender with K-Lionheart, who designed Dungeons and Voltron for us when she appeared on the podcast as our Voltron Fan Artist Spotlight. As Always, Thank You for Listening! Let's Voltron! !